Your eyes are one of the most essential parts of your body used for playing sports! Whether it’s eye tracking, hand eye coordination, or depth perception, your eyes play an integral role in athletic activity. That is why Sports Vision Therapy can be a vital tool in enhancing athletic performance. Through a progressive system of vision exercises, vision skills and abilities critical to athletic performance can be improved. Sports Vision Therapy starts with a thorough assessment of your eyes and vision, determining the strengths and weaknesses of your ocular abilities. Our team will perform vision tests that are relevant to athletic ability, testing things like refractive errors and contrast sensitivity. We also test how well the eyes work in tandem, which can present problems if one eye is overly dominant. Once the assessment is complete, we will develop an individualized vision therapy program. This program will be tailored to your specific needs and deficiencies, which will help you attain your athletic goals. 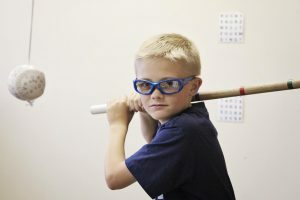 While the program is not necessarily about strengthening eye muscles, Sports Vision Therapy helps correct and enhance the way you interpret visual information, allowing you to translate that to athletic performance. We know that sports play a vital role in many people’s lives, and that your performance matters to you. That is why we are proud to help you enhance your athletic ability through Sports Vision Therapy. Not all training is done in the gym!